LP met een gewicht van 180 gram, gemaakt in Duitsland door Speakers Corner Records. Puur analoog, audiofiele mastering vanaf de originele mastertapes. Originele uitgever: Columbia. Leveringsomvang: 1 x 33 toeren langspeelplaat in een LP cover (350gr/m2) met gevoerde binnenhoes. Planète Disque verpakt iedere LP zorgvuldig in een stevige doos met opvulkartons en een luxe plastic buitenhoes van PVC. 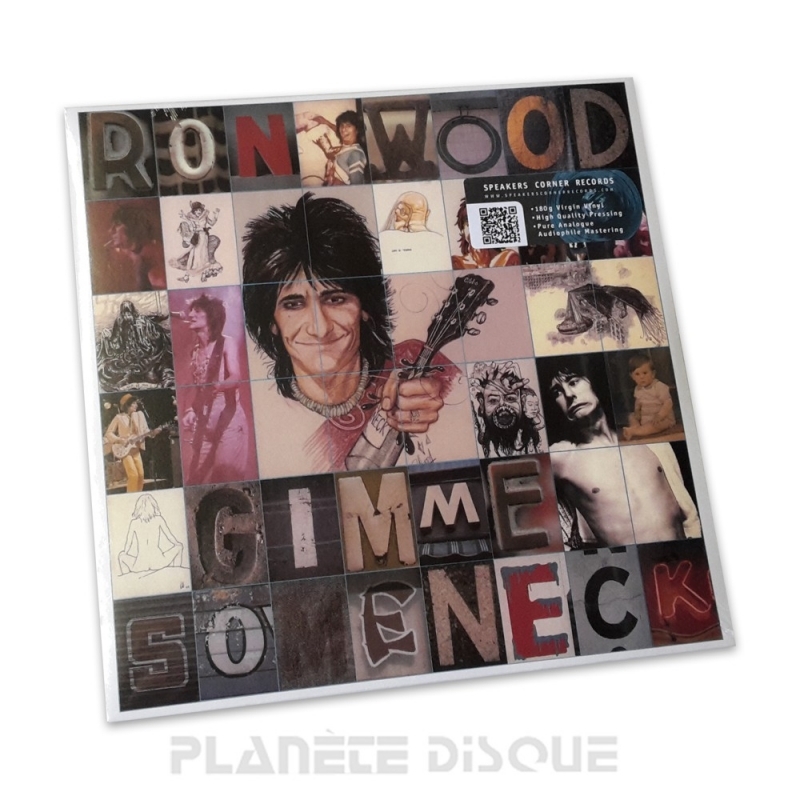 "Gimme Some Neck" - Ron Wood (g, voc, hca); Bobby Keys (sax); Mick Jagger, Keith Richards (g, voc); Dave Mason (g); Ian McLagan (keyb); Swamp Dogg, Harry Phillips (p); Mick Taylor (b, g); Mick Fleetwood, Jim Keltner, Charlie Watts (dr); a.o. 'Gimme Some Neck' - words with a double meaning! Ron Wood’s demand for a guitar and/or a bottle serves well to demonstrate both his lifestyle and his commitment to music. On the one side he is a rock’n’roll legend who played his way up the career ladder beginning with the Jeff Beck Group via The Faces to become a member of The Rolling Stones. On the other side we hear a man who was not adverse to the odd drink now and again, but who was a musician through and through, and whose slick hands conjured magical waves of sound on his slide guitar. This sound is brilliantly demonstrated in the opening number "I Don’t Worry No More", with its bluesy, earthy honky-tonk groove. It is followed by "Breakin’ My Heart", which gives us a glimpse of Wood’s soul by means of sharp organ chords which come from a psychedelic abyss. Then he turns another corner to take us to the gentle, sensitive poetry of "Delia" with an unamplified guitar. Woods presents "Buried Alive" and "Come To Realize" with powerful vocals and enough power for a stage performance, and then comes a previously unreleased song by Bob Dylan - "Seven Days", in which he sounds more like Big D than D himself. But this is no cover version for Wood’s personality is more than alive and kicking. Ron Wood remains Ron Wood - totally distinctive and quite inimitable.